The only ‘Big Three’ that poses a true threat to Golden State is something along the lines of Scott Foster, Tony Brothers and Zach Zarba. Having grown completely uninterested in the regular season after years of winning, the Warriors appear to be using the referees to cure their boredom and take out their frustration all at the same time. Tuesday night was just the latest example. Kevin Durant unleashed on the refs after claiming he was fouled on a three-point attempt, copped an ejection for his troubles, and stormed off the floor while offering further expletives. The officials had no time for Durant’s theatrics and there was a good reason why: Golden State have developed a reputation as the most insufferable whingers in the league. 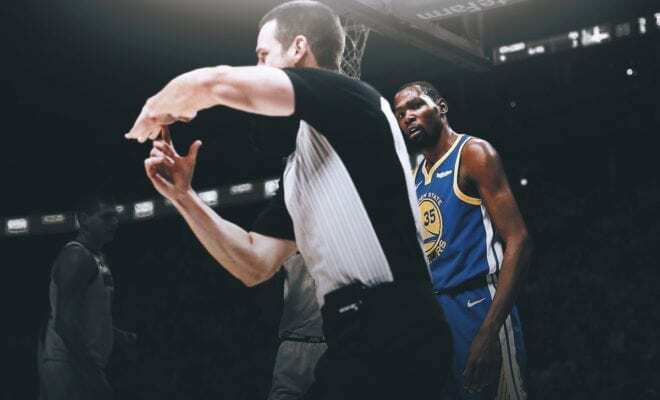 The refs are just as sick of the Warriors as the Warriors are of the regular season, and Tuesday night’s incident was just the latest instalment of this Warriors vs Refs series. Previously on the show, Durant was livid after having a potentially game-winning play waved away against the Timberwolves on Friday. Steph Curry then hit a game-tying three anyway and taunted the ref, only for those pesky whistle-blowers to ruin everything all over again by calling a foul on KD in the dying seconds and handing Minnesota the game in the process. That Wolves game marked the pinnacle of this whole saga, so far at least, because down the stretch it really did feel like the Warriors were competing directly with the refs. The Timberwolves just happened to be there, caught in the crossfire of a battle they had nothing to do with. After the game, Draymond Green was fined $35,000 for comparing referee in question, Marat Kogut, to noted cheater Tim Donaghy. Curry was fined $25,000 for calling Kogut the “MVP of the night” and Durant was fined $15,000 for publicly criticising the officiating. The Warriors have made their stance on the league’s officials loud and clear. But not only is it a terrible time of year to do such a thing with the postseason right around the corner, but why pick a fight with the only crew in the NBA you’re never going to get the better of?